Is anyone else in the process of growing out bangs and finding that bit of hair that is forever falling into your eyes incredibly annoying and unattractive? Well, I've been having problems with it recently, and here is what I've come up with to solve it- hair accessories. They're cute and adds a little something to your usual hair style. 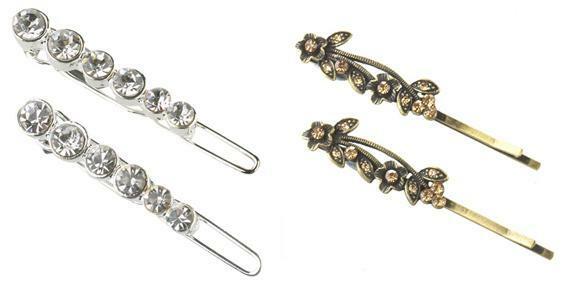 There are the classic bobby pins, like these two Accessorize. These simple yet elegant designs can go with just about any outfit! Then there are these larger clips from Accesorize and Claires respectively. And remember, they don't always have to be on the side either. Try twisting the bangs on top and clipping it down, with these pretty clips, for a more voluminous look. 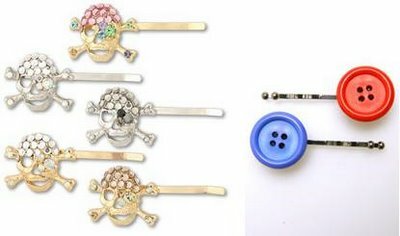 For something a little more interesting, there are these skull pins from Intuition and funky button pins from Urban Outfitters. 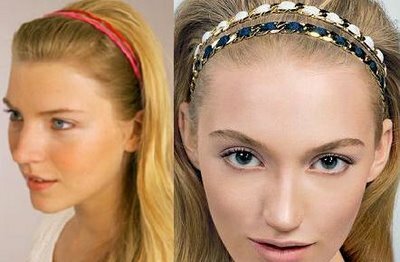 Headbands is yet another fabulous way to keep the bangs off your eyes. I especially love these multiple skinny headbanks from Urban Outfitters and Cara. 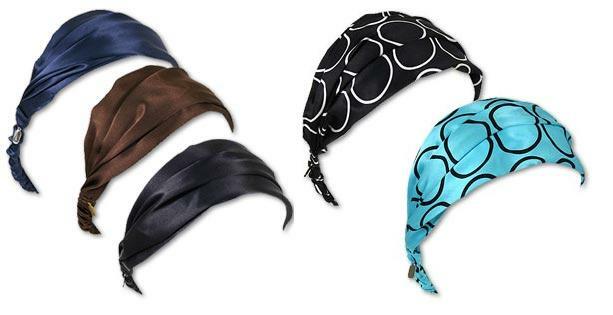 And of course, there are these scarf-like headbands that are so trendy this season also from Intuition. The circular patterned one on the right is fun and quirky, but I like the simple silk bands with its very elegant and sophisticated colors best! How do you keep your bangs out? I got a lovely response to my post on headbands several days ago- apparently, literally everyone likes them. You should check out the various other headbands in my post, they are lovely! I personally am not a fan of clips, as someone who recently graduated from university, I don't think I am at the age where I can truly pull them off, maybe if it's the right clip, hehe. With my hands, hair spray and great amounts of frustration!! HAHA AND YOU KNOW EXACTLY WHAT I AM TALKING ABOUT. I will now go and get those head bands from Cara because they are pretty much incredible. Well I was until I saw the price, but how grand to they look?? I use the headbands, just to get the hair off my face at work and when its really hotoutside. I don't know about the clips, b/c I feel like a kid with them. I will check them out. I love scarves and cute hairclips (especially the big and shiny ones from Tarina Tarantino), but headbands with combs attached just don't work very well for me. For some reason, my forehead just doesn't look right when fully exposed. Headbands without combs won't stay on very well. It's possible to pull off hairclips without looking like a kid. I usually pair my bright and shiny hairclips with more sophisticated pieces (e.g., heels, blazer) to look "grown up" but a bit playful. Otherwise, I think the "classic" ones in the first picture work perfectly well (I have a couple of those that I've worn with suits). if youre going to use bobby pins..
goes through a pack at least every 3-4 days (and it's a big pack!) Go with headbands-they don't get lost! holy crap, i LOVE YOU!!! you make the best posts ever and i hope you never go away! i'm growing my bangs/layers out and they're ALWAYS in my face! LOVE the last ones! <3 you rock my world. I bought two scarf like headbands in London at Monzoon. Just love them! I know it's a bit fashionista trailer trash, but I love to use the silky ribbons off boxes from Tiffany, Fendi and other upscale brands as informal headbands. Wrap, tie, move bow to the back, and you're "designer" on a dime! I grew out my bangs really long, so they're like choppy chin length layers. But that area in between was ah-noying. If they're long enough just pull your hair back. But those tips you gave were excellent! I think clips are fabulous for anyone no matter what their age. I've always been a big fan of headbands and scarfs to get bangs out of the way. I love those gold Accessorize hair clips! i'm going out shopping now to buy them! I usually clip mine straight back in kind of a poofy-thing. Although, I also pin it back and then slide my headband over the clip, because otherwise my medium-ish bangs fall down the sides of the headband, which I don't think is very attractive. When I went through this tragic phase of hair re-growth, I found using some product helps to sweep your bangs accross your forehead and give them some lift. My favorite was the "self control" stick from aveda...makes you smell nice too. Sometimes a head band and clips just don't look right on some women. Slavetoshopping, I have fine straight hair too, so I use bobby pins on the side of my head (near the ears) to help the scarf stay on. To keep from looking like a cleaning lady, maybe a long, skinny chiffon scarf in a bright color will do. oooh, i have chain headbands i forgot all about, im glad chains are back!! I recently had a painful experience with bangs so, I have been using many haedbands and styling products. I have found that heads bands work best, and they can go with almost everything. Although, the key is to acessorize wisely. Wear whatever fits your style. I wore bangs many moons ago and I wore my hair curly while they were growing out. I'm luv'n those skull bobby pins. So hott! 0810jejeair jordan 23 homme À 50 $, le asics chaussures tennis prix se sent un peu raide, essayez de découvrir ce briquet en vente, vous ne serez pas déçu. air jordan 3 homme pas cher Comme vous pouvez vous attendre à des arrière-plans criards ou assez lourds, il est difficile de air jordan 1 chicago lire ou de se concentrer sur d'autres points du site. Former une équipe virtuelle nike air jordan mid 1 multiculturelle peut aider Nike Business à exploiter le marché émergent en introduisant des articles air jordan 11 low france uniques dans différents pays comme des baskets bon marché spécifiquement pour le Brésil (Fischlmayr & basket nike presto 39 Lahteenmaki (2005).) Comparé à une équipe centrale, une équipe virtuelle multiculturelle est devenue moins cher air jordan 5 3lab5 elephant print et beaucoup plus possible grâce à l'avancement des technologies.La vitesse croissante dans les affaires basket nike pegasus homme a également fonctionné en faveur des équipes virtuelles qui perdent beaucoup moins de temps par rapport aux équipes chaussures adidas zx flux bleu marine centrales.